At a hastily convened meeting of the Governing Body of St. Stephens College to discuss the issue of autonomous status for the college today, the decision to go ahead with the proposal was agreed to in principle, despite the opposition of four members of the Governing Body. 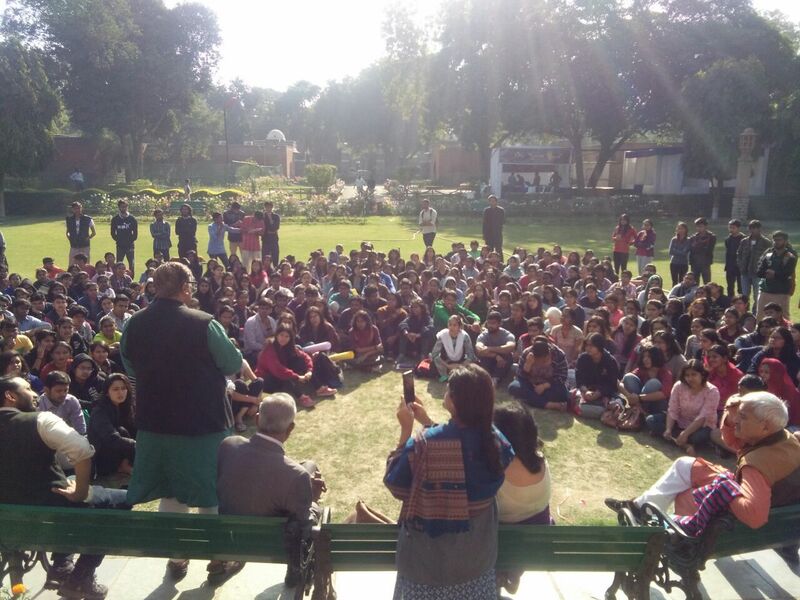 This meeting of the GB was met with a huge silent protest from students, teachers, and the non-teaching staff of the college. Students who demanded that they, and the teachers, should be consulted by the authorities before they decide to go ahead with applying for autonomy, held placards and posters with slogans like ‘Discuss, not Decide,’ and ‘Come, Communicate, Convince’ written on it. 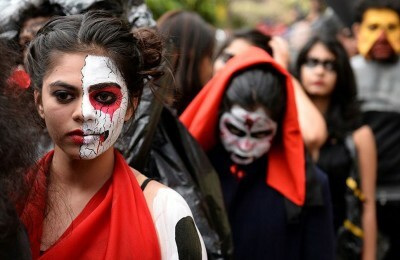 This protest by the students was also supported by a protest outside the college gate by members of the Delhi University Teachers Association. 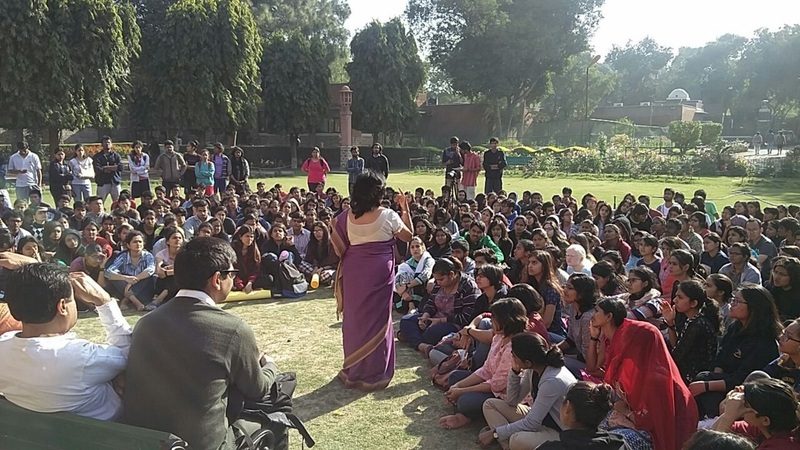 “More than 500 students of St. Stephen’s College gathered in the Senior Combination Room lawns to stand up for their rights, for the entire college community. 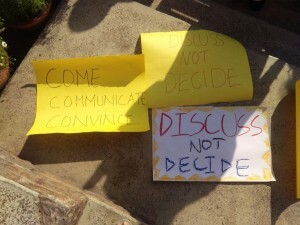 The students and the faculty stood in protest as a consensus of all stakeholders is necessary before a Governing Body Meeting regarding application for granting of autonomous status to St. Stephen’s College is convened,” says a press release issued on behalf of the students of the college. The students also alleged that one of the GB members, who is a University representative, claimed that he came to know about the meeting from the newspapers and learned that his signature was forged on arriving at the venue. 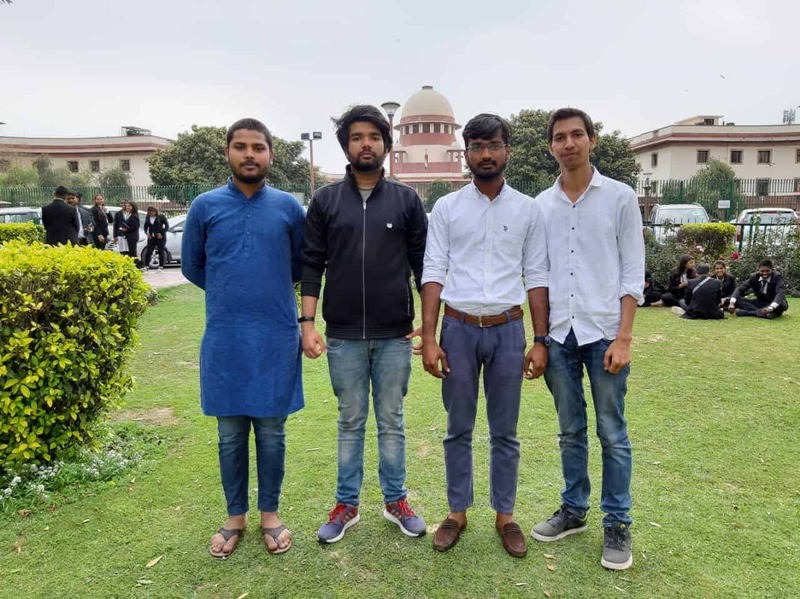 The students demanded that the process of achieving autonomous status be halted until a consensus is reached among all students, teachers and non-teaching staff. Meanwhile, at the GB meeting, the teacher representatives, including DUTA President Nandita Narain, pointed out that even the UGC Guidelines stipulated prior consultation with students and teachers before applying for autonomy, after which the GB voted in majority to move ahead with autonomy in principle, but follow the procedure laid down for consultation before sending the application to the University. DUTA also staged a protest outside the college and said that this is a move by the government towards privatisation. “We want academic and governance autonomy for the University but not autonomy for the constituent colleges. We will not let anything happen without consensus and will oppose the move,” said AK Bhagi, an Executive Council member. 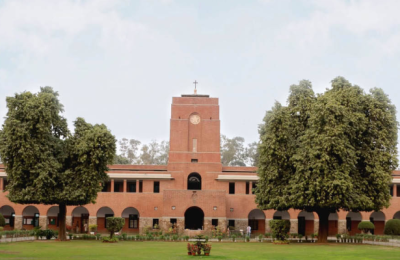 Earlier this year, after UGC came out with new provisions for granting autonomous status to institutions, St. Stephens decided to apply for autonomy. Other colleges including Hindu, SRCC, Ramjas, Sri Venkateswara College and Hansraj have approached the University for granting them greater autonomy. Although autonomy will allow colleges the freedom to decide their own syllabus, course and examination patterns, this will also make the college responsible for raising its own funds which may result in a sharp increase in the fees that students pay. This is a prime concern, since many students come from different backgrounds, and may not be able to afford the exorbitant fee hike if the college goes autonomous.